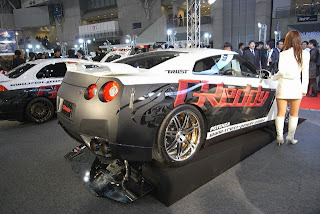 From the Kultivate Blog Greddys R35 , with new exhaust. Still 4 exhaust tips. Although I did see ARC was working on a single big rectangular tip. TAS is a little soon after the release of the R35 GT-R to see any real radical changes in cars. Next year , I would expect some craziness.